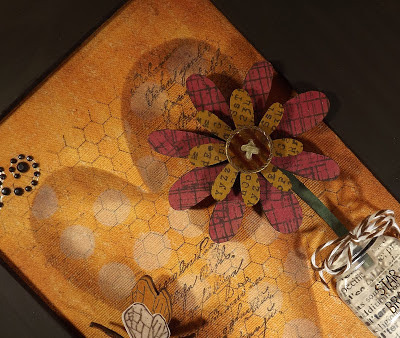 Hi everyone and welcome to the starting point of our Make Art blog hop, featuring art from the eTeam and special guest, Wendy Vecchi! We're delighted to have Wendy joining us today, to not only share her products but also to share in her unique artistic style and to be inspired by each of the hop participants. The full blog hop list is below but read through a few details of the hop before you start browsing! During the hop the team is going to be sharing the projects that they created with Studio 490 products but maybe more importantly we'll be sharing our experience of working with the products, how we created our projects, and what inspired us to create our piece. The eTeam is a wonderful group of talented women, each with their own style. Some of us are clean and simple card makers, others love scrapbooking, and still others are drawn to altered art and mixed media projects. The goal of our hop is bring each of these designers and their favorite mediums together and to share how we've used these products to express our own individual styles through our work. But...that's not all...eclectic Paperie is also offering a few specials during our hop. This week only save 25% on all Studio 490 products, this includes Wendy's stamps, stencils, Art Parts, Book, and Blossom Bucket embellishments. Use code WENDY25 when checking out. During the hop, comment on each blog and you'll be entered into a drawing for a prize package worth $50! Your package will include a collection of Studio 490 products as well as paper and embellishments from the store. We want to hear about what inspires you! Share your thoughts about why you create, what styles you're drawn to, even share a favorite project on our Facebook page. Next week I'll randomly select a winner from those who have commented on our Make Art Facebook posts and give away a $25 gift certificate to eP! Now...are you ready for some crafty goodness? Let's get hopping! What a great blog hop!! I get inspired by checking blogs and such. I create as a form of keeping my mental state in check! I hope all is well where you are. Thanks for the hop - I love seeing what others create. Looking forward to seeing all the creations and reading about the process. Art keeps me sane. That's why I create. I LOVE Studio 490 and can't wait to start the hop! AND I get to see the fab-U-lous Ms. Wendy Saturday in class! Yeehaw! Fabulous blog hop. I love seeing all the different styles and techniques using similar products. This has been a fabulous blog hop. I have learned so much and come away inspired. Amazing art from the DT, guest, and THE Wendy. Loved every minute of it. Thanks. What a perfect opportunity to get some great inspiration and to learn more about your wonderful products. Thanks for the chance to win. Love your blog, and have purchased several different Art Part products. They are great. Love your store and blog. thank you so much for this blog hop…always love seeing how others make art studio 490 style! How fun Kim! off to check out all the inspiring projects! I've been wanting to try all this art stuff!! I'm so happy to "hop" tonight! It's cold, windy, rainy/snowy and the perfect night to enjoy work inspired by by favorite artist! Thanks for doing the HOP! It has inspired me. Love Wendy and her style! Enjoy your hops here so off to see all the goodness! Enjoyed the creativity on the blog hop. Got my high-heeled craft kicks on and ready to start hopping! I just know I am going to find numerous musts from this hop! Love the hopping and seeing all the fantastic art pieces. Inspiration abounds! Can't wait to see what everyone has done. Thanks. This is a creative way to blog...fun!